Dark social sounds ominous, but it’s an often overlooked part of content marketing. Google analytics lists the number of shares through Facebook, Twitter and other platforms, but often fails to capture the detail of direct shares through private messaging apps. Alexis C. Madrigal termed this phenomenon “dark social” back in 2012, noting that the internet was always about information sharing, long before the development of social media. 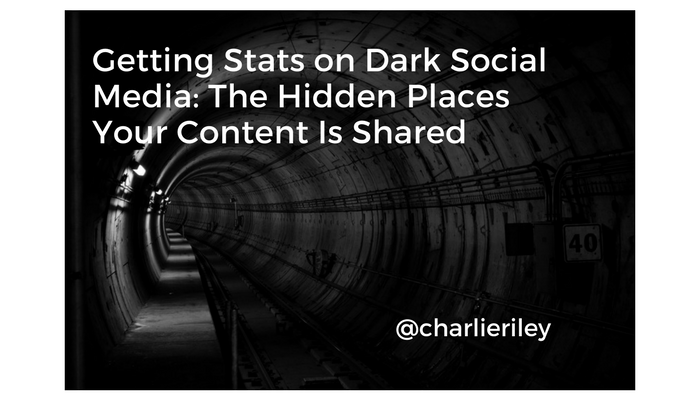 Depending on the source, dark social is said to account for anywhere between 69 percent and 84 percent of content shares. Marketers who pour significant budgets into content have to delve deeper to understand what is the ultimate source of their dark social shares and how to harness it. Google usually puts dark social into the broad category of “direct traffic,” which implies users either clicked on an existing bookmark or manually typed a URL into a browser. But typically these hits come from a different source, such as clicking on a link in a private message, or referral from a secure (https) site to an insecure (http) site. PDF documents and other non-html pages also show up as direct traffic. Some subject matter is shared more frequently on dark social than through public social media networks. Personal finance and careers are just two examples of the kinds of content that people often prefer to exchange privately. How Can You Track Dark Social Media? Private exchanges are just that: private. However, it’s increasingly possible to use free and paid tools to shed a bit more light on dark social and improve the accessibility of your content. Use short URLs. URL shorteners, such as the one provided by Google and bit.ly let you create a shortened version of a page’s web address. When that link gets hits, you can source it back to wherever you first placed it: for example, on your website homepage or blog. You can even automate this process to notify you of hits by using Zapier to alert you of specific bit.ly activity. Real-time tracking. If you get a spike in direct hits, look for simultaneous increases in traffic from social media platforms. The game of “telephone,” where one person finds a link, sends it to another through a private message and so on, may have originated when the link received wide exposure via a social media site. Analytics platforms. Given the increased interest in dark social, many free and paid sharing apps, such as Po.st, ShareThis (ShareThis) and GetSocial.io, which offers in-depth statistics about where people find your content. If there’s any lesson about the phenomenon of dark social, it’s that people share content they find useful and interesting. For this reason, creating quality content should be your primary objective for any digital marketing strategy. Charlie Riley is a marketing, business development and communications professional with experience across multiple industries. Follow Charlie on Twitter at @charlieriley or connect on LinkedIn.